A very fine, time-consuming storm, that is. 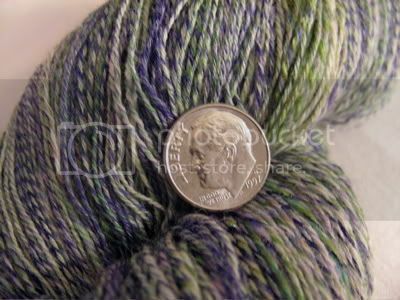 I’ve spun (almost) half of the 14 oz of the “Twist and Shout” project. I’ve been fixated on spinning “fine” yarn, and may have gone a bit overboard. That’s 872 yards to 113 grams. Laceweight. Four plies equals laceweight? Yes. Did I do it deliberately? Not quite. See, the intent was a heavenly sock yarn. I’ve got two plies of superwash merino top from Crown Mountain (Twist and Shout), one ply of 50% superwash merino/ 50% Tencel (in Clematis) from Susan’s Spinning Bunny, and one ply of silk from Susan’s Spinning Bunny (in Tropical Sea). 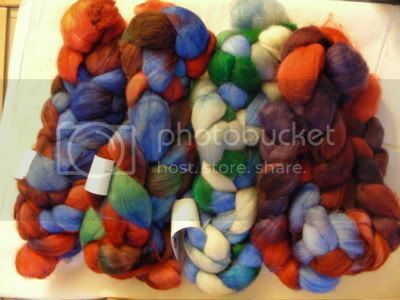 If I did the math correctly, that makes for a yarn with the following fiber content: 62.5% Superwash merino, 12.5% Tencel, 25% Silk. Sounds terrific, right? I’ve had time to think about it and deliberate on what type of lace to knit out of it (simply because I’m not insane ENOUGH to knit laceweight socks), and I do like it. It has just become an interminable project because of how fine it’s been spun. I’ve only spun half of the total roving (so, eight out of sixteen ounces), and I’ve only plied four of those eight ounces. For now, I think I’m going to finish plying what I’ve spun, and take a break from this spinning project, since eight ounces will knit a (more than) respectable shawl. I have some Christmas roving (from the C-dawg) that I’ve been itching to spin, as well as some new stuff that I picked up. Yes, I know that I said I was going to buy less, and I have. 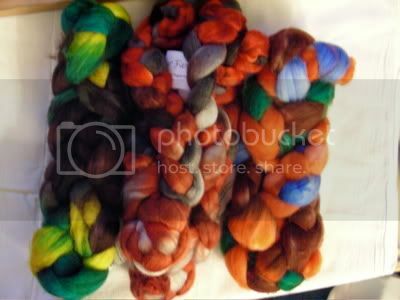 I restrained myself at Stitches and did NOT buy any of the Fiber Fiend roving. This was a bad move. While Cynthia was spinning hers up, I was all lustful and covetous. I’m sure there’s some sort of commandment about lust and coveting, so when I found out that she was doing a trunk show at Purlescence, I picked up only the stuff I loved. The upside of both the Colleen Gifted roving and the Fiber Fiend roving is that most of it comes in 4 oz bumps. I am not complaining about the 8.5 oz bumps from Crown Mountain- the size is both a blessing and a curse. It’s super-well-priced, and they give you a lot of bang for your buck. But, I am a compulsive spinner, and that’s where the curse is. I don’t have “leftovers” when I spin. I may have leftover yarn when the project is finished, but I don’t have a handful of roving here and there. I spin it all. It’s the spinning equivalent of clearing your plate. I don’t need to spin 8.5 oz for socks for myself. If Andrew likes the color, then I spin it all up and we both get handspun, handknit socks, but usually, I give the second half of the spun yarn away. I don’t know exactly where I developed this compulsion, but I certainly was not raised in a “clear your plate” kind of house. I was raised in a “dish as much as you plan to eat, THEN clear your plate” kind of house. The appeal of spinning all of the roving is the feeling of completion when that last little bit of fluff turns into yarn. It gives me what I like to call a “Spinner’s High”. It’s like a runner’s high, without all that pesky exercise. Good GOD Woman! Is that what you were spinning at your holiday 'do' and because we couldn't see anything coming off your hands we accused you of fake spinning? Yeah, I'm finding I can't leave any leftover roving either.